Jacqueline Woodson is interviewed by host Richard Wolinsky. 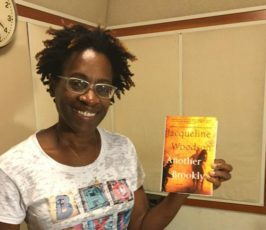 One of the leading writers of children’s and young adult fiction, Jacqueline Woodson’s latest adult novel, “Another Brooklyn,” tells the story of four African American girls growing up in Brooklyn during the 1970s, focusing on August, a transplant from the South with a single father, growing up during a turbulent era and struggling to find herself. “Another Brooklyn” is a finalist for this year’s National Book Award for fiction. An extended 37 minute version of this interview can be found here.